The 1st stage in this years Tour de France had one major drawback in the form of a massive crash just 10km from the finish that saw many riders delayed, while those in front happily went on their way. Throughout the stage HTC High Road and also Omega Pharma Lotto were the ones setting the pace at the front of the peloton, keeping the breakaway of three riders within a 7′ distance. Those riders were caught with about 20km to go in the stage. Stage 2 on the Tour was the team time trial event with us Aussies having to stay up until 1am (ish) to see Cadel Evans and his BMC team go for their time. However it was Alberto Contador and Saxobank that made the early time and one people thought would be tough to beat, however a number of teams did including Thor Hushovd and Cadel Evans’ teams. The 23km length of this time trial is a fair distance shorter than previous TT’s which made the teams expel more energy to try and keep up a consistent pace around 60km/h for the entire TT. The 3rd stage was a very boring, flat 198km to Redon, with no adjustments in the lay of the land at all. Simply put, this was a stage for the sprinters and as such, Mark Cavendish was the favourite to take out the stage victory. It seemed to all be going to plan for Cavendish as well, with HTC forming a perfect line of their riders down one side of the peloton and making their way to the front to springboard Cavendish to the finish. Unfortunately it wasn’t to be with Tyler Farrah spoiling the party and taking the stage for himself and the second straight stage win to the Garmin-Cervolo team. The 4th stage was again another flat trek with a nasty climb in the final 2km dubbed “The Wall”. It was almost a stage to forget for Cadel Evans who found himself separated from the front of the peloton on one occasion and then when he had found his way back to the front, discovered a bike problem. However it was the perfect stage in the end by the Australian who won the stage, his first in the Tour de France, but didn’t get the yellow jersey. This is good for Evans as he is without a doubt better with no yellow jersey until later into the Tour. The ride of the day goes to Thor Hushovd, who retained the yellow jersey and his 1″ lead over Evans. Many experts thought Hushovd would struggle with this stage and would fall down the rankings, however it wasn’t to be. Alberto Contador also tried to breakaway and get some much needed time back on Evans and Schleck, however Evans was up to the task and pipped him at the line to keep him 1′ 42″ behind. Another stage for the sprinters in stage five, one that was to be interesting towards the end due to the heavy narrowing of the roads. However, it got very interesting well before the finish line! Stage five was filled with falls, crashes, injuries and the odd bit of niggle. Janez Brajkovic, the leader of Radioshack, was the main casualty for the day, crashing with a number of other riders and hitting his head very hard against the road. He seemed to be unconscious for a minute or so before sitting up and having the Tour doctors evaluate him. An ambulance came and took him away, effectively leaving Radioshack without a leader to ride for. Thomas Voeckler broke away with 30km to go and almost made it to the finish, being caught by the Peloton with less than 2km remaining. It was a good old fashioned sprint to the line to close out the stage, Mark Cavendish again showing his superb turn of speed and class as a sprinter, bolting through the other riders with 50m to go to claim his first stage victory of the year’s Tour and his 16th career Tour stage victory. The key moment of this stage was yellow jersey hopeful Bradley Wiggins crashing out of this years Tour. Wiggins looks like he has a broken collarbone after falling heavily onto the road and has abandoned the Tour due to this injury. Sprinter Mark Cavendish was the stage winner, on a very flat stage that suited him to the core, he didn’t let the favouritism get the better of him. 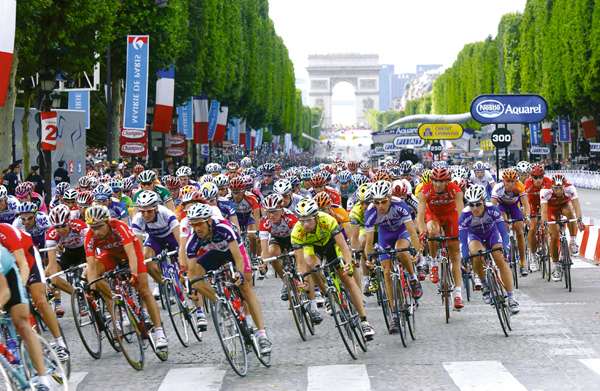 This ninth stage of the Tour de France was littered with crashes, injuries and abandonments. None bigger than Alexandre Vinokourov, who was sitting 11th in the overall classification and was touted as a podium chance. Vinokourov appears to have fractured his pelvis which will undoubtedly shorten his career, although he planned to retire at the end of the season anyway. Thor Hushvod has lost the yellow jersey after holding onto it since Stage 2, Thomas Voeckler worked his magic from a breakaway and is now the race leader after erasing a deficit of 1’29” and turning it into a 1’46” lead. Also of note, a car ran into a rider from the breakaway causing him to crash and sending another rider into a barbed wire fence! The car and the driver have since been kicked out of the Tour de France. Different day, similar result once the riders reached Lavaur. Once again a stage for the sprinters and once again it was the usual suspects at the tip of the spear at the stages conclusion. Mark Cavendish grabbed his third stage victory for this years Tour, narrowly beating out rival Andre Greipel. Cavendish got a measure of revenge here as in the stage 10, it was Greipel who narrowly defeated Cavendish at the line. The win also moved Cavendish into the sprint kings green jersey. Well, well, well what have we here? Finally there was some action between the main contenders for the overall Tour de France victory and it served up a shocking twist. Within the final 5km the Schleck brothers began to double-team the other riders and started some breakaway attempts. They were all answered by Cadel Evans, Alberto Contador and Ivan Basso until Frank Schleck broke away again within the final 3km. Evans and Basso gave a feeble attempt at a chase, while Alberto Contador was left floundering behind and lost more time to the other contenders. Sammy Sanchez picked up the stage victory in what is the first of three straight stages involving mountains. Former Yellow Jersey holder Thor Hushovd raced this stage of the Tour to absolute perfection! He played the best race tactically that has been seen in this years Tour de France and ended up with an excellent stage victory. Frank Schleck put 20″ between himself and Cadel Evans as he and his brother double-teamed the other main contenders just out from the finish line. After three straight days of mountainous riding for those left in the Tour de France everyone, especially the sprinters, were happy to see a flat stage. As it turns out, Mark Cavendish was the happiest of all. The “Manx Missile” once again claiming a stage victory, his fourth at this years Tour and his 19th overall. Thomas Voeckler remains in the yellow jersey after navigating his way, surprisingly, through the previous mountain stages. 3) The Schlecks dislike wet conditions and descending mountains, doubly so when they have to ride in wet conditions down mountains. On a stage that wasn’t meant to show such action, wow….I can only hope that more of the same happens tonight! 2. Cadel Evans at 1:45.